Doors From Dishes: Almost There! 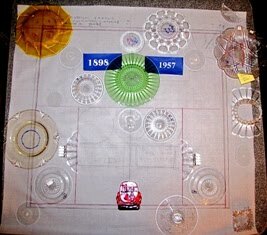 These four panels are calling on all the skills and knowledge about stained glass construction that I have learned since I first started working in glass in the 1960’s. In addition, these panels are requiring many new approaches with new solutions. Because the Heisey glass is not flat but actually three dimensional, there is the challenge of fitting the pieces together while maintaining the design and having the entire panel fit within the required depth dimension allowed so that the panels may be sealed between two layers of plate glass for installation in the new doors. 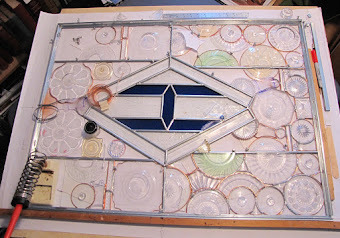 One goal for these panels has been to use glass from the Museum that was broken or damaged. 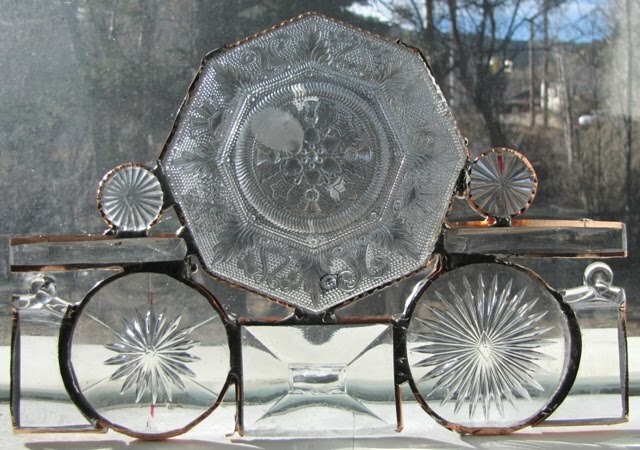 Many pieces have chips, cracks, major scratches – all of which turn them into “scrap” glass. 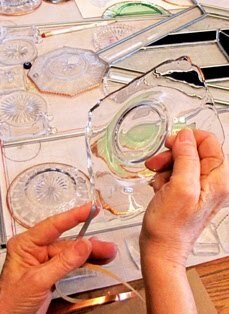 For my purposes, a great deal of this glass can be re-purposed through careful cutting and grinding into quite useable pieces for the panels. 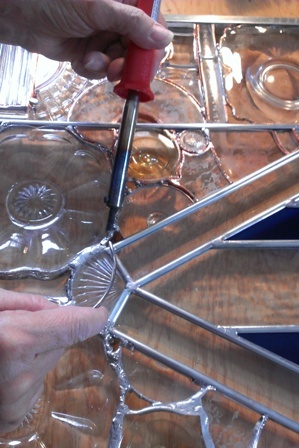 Often times a third of a plate will clear the imposed depth while the full piece will not, it is too deep to fit. The base of a goblet can become a roundel and slices of a goblet’s bowl and be flat enough if properly trimmed. The internal strengthening created using zinc calming (caming) as an integral part of the overall design also defines the internal sections, helping to control the fitting of the glass into the overall allotted depth. Having completed the upper two panels to the point where they can be put upright for a full visual inspection, two things are immediately apparent. These panels are very sturdy – the internal barring is quite strong and the glass itself (much of it is amazingly thick) adds strength. 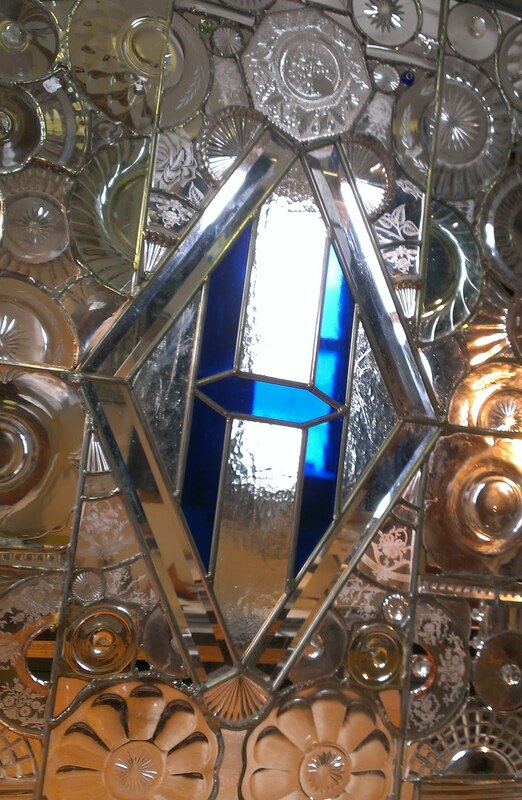 The second thing is that the high quality of Heisey glass – its shear clarity and sparkle – makes these panels impressive. They seem to glow. 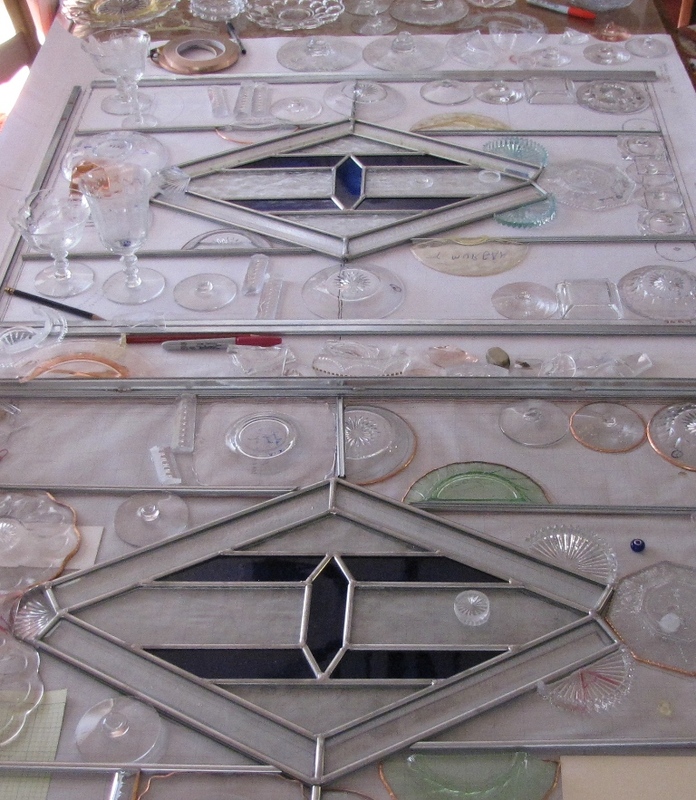 Another area of discovery is working out the adjustments to each piece so that the pieces may be soldered together after they have been foiled in the Tiffany style. Some of the individual pieces require over an hour of special grinding to get the proper fit. In most cases, variations in the three dimensional geometry allows for a good fit through physical contact. Occasionally there are larger gaps to bridge. Since the panels are enclosed, some of those gaps can be left open, accent the three-dimensionality of the panels. However, all this non-flat surfacing will make the final cleanings of the panels quite an undertaking. This too, will be an adventure. 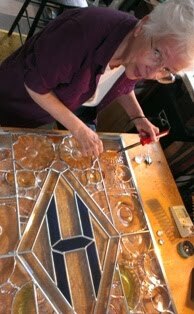 I have taken great care to include as many of the various patterns, etchings and colors of Heisey glass as possible. 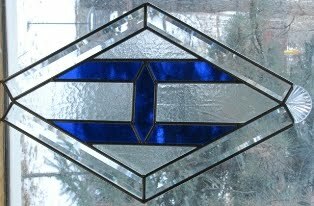 The panels have the same theme and basic layout but each one has its own variations, Look for the Diamond H in many pieces; notice the differences and the similarities; and mostly enjoy these door panels.